For many years the most common explosion protection strategy was venting. Used correctly, explosion venting remains a viable strategy. While venting is usually the most cost effective method of explosion protection, there are circumstances where venting is impractical and explosion suppression a preferable option. 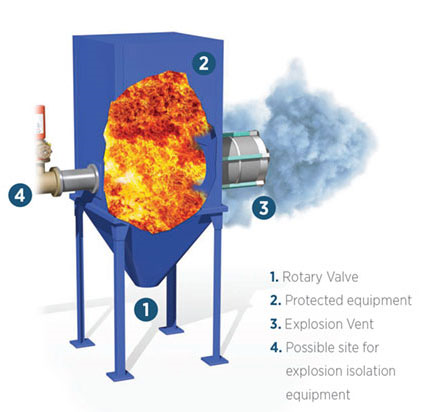 Since the goal of explosion venting is to release the explosion overpressure before the process vessel is damaged, burnt and unburnt dusts and vapors are released through the vent opening. The ejected fireball, with a typical volume eight times or more larger than the vessel volume, must be released to a safe area. It is important to note that since explosion venting only relieves the deflagration pressures from the vented process vessel, post-explosion fires are to be expected. Appropriate fire control measures should be incorporated into the process plant safety design. 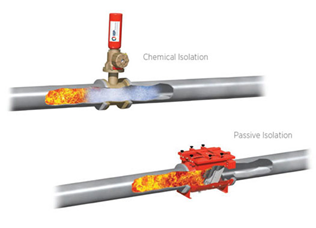 In addition, explosion propagation through connected ductwork is likely to occur, so explosion isolation is required.